2 Have you ever heard yourself say . 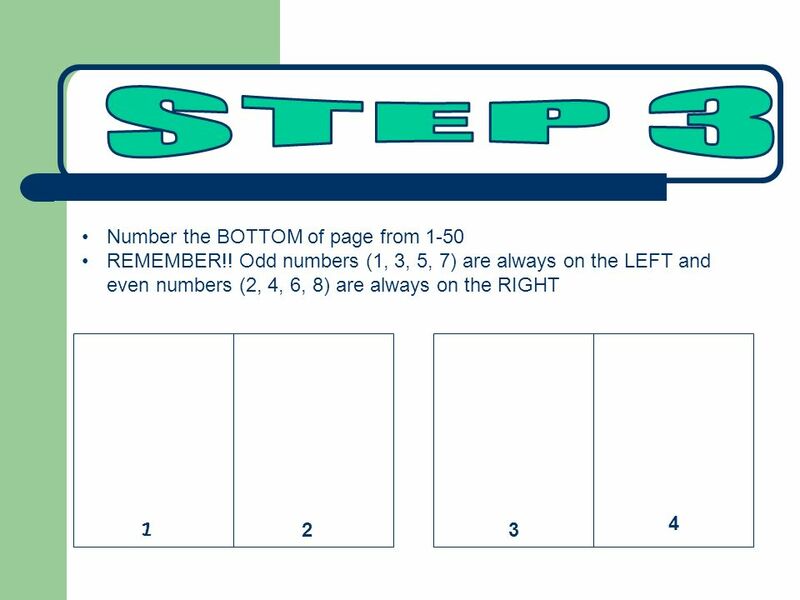 I can't find my . 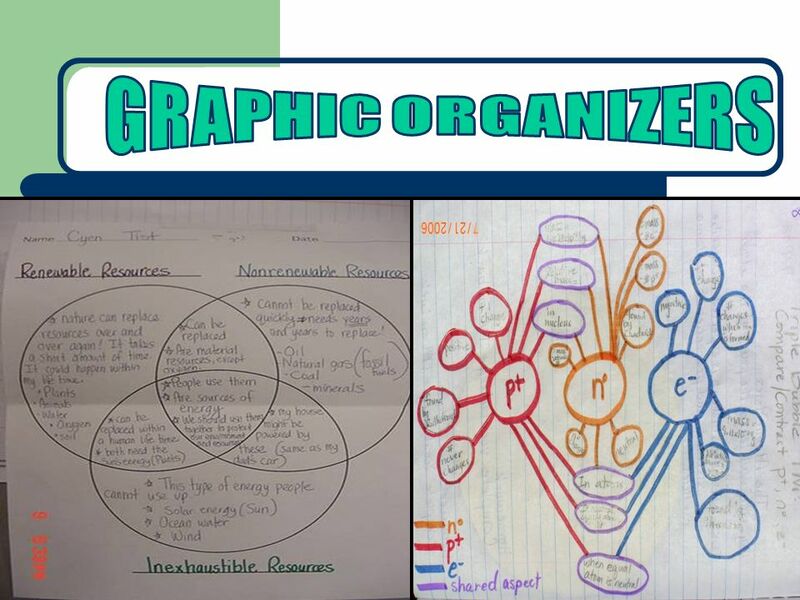 . . notes, homework, old quizzes . . . 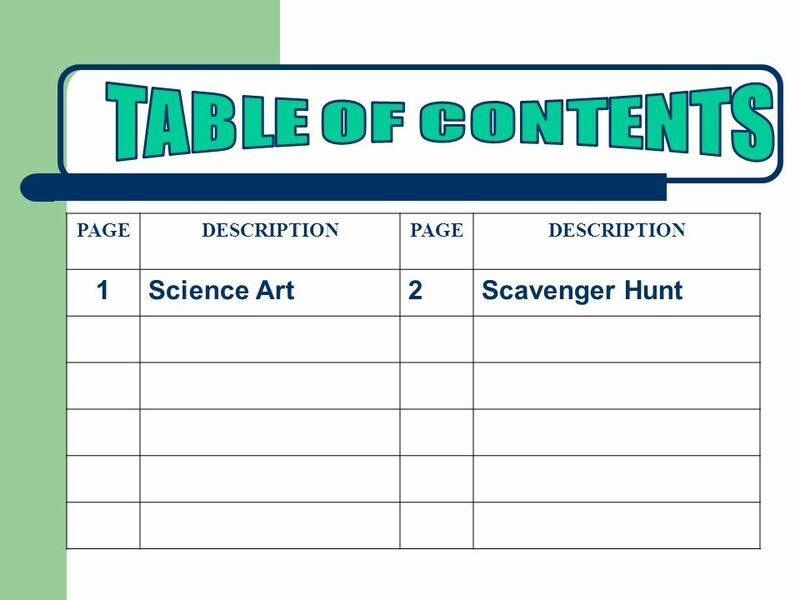 I can't remember what we did in class yesterday. I'm sure its in . . . my locker . . . my book bag . . . my room . . . 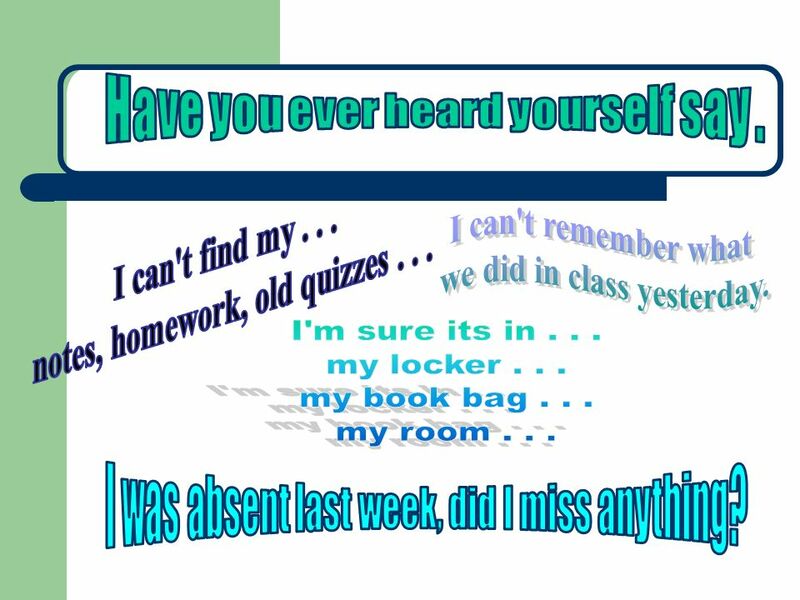 I was absent last week, did I miss anything? 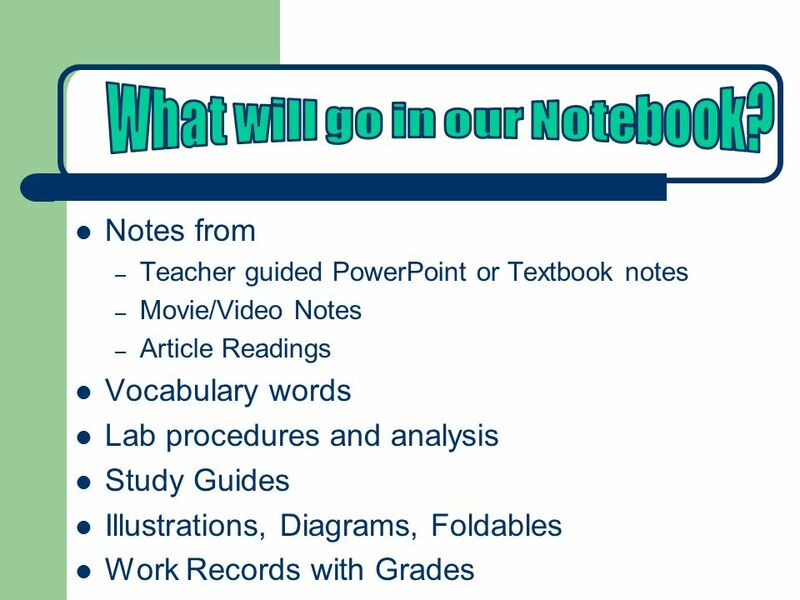 7 What will go in our Notebook? 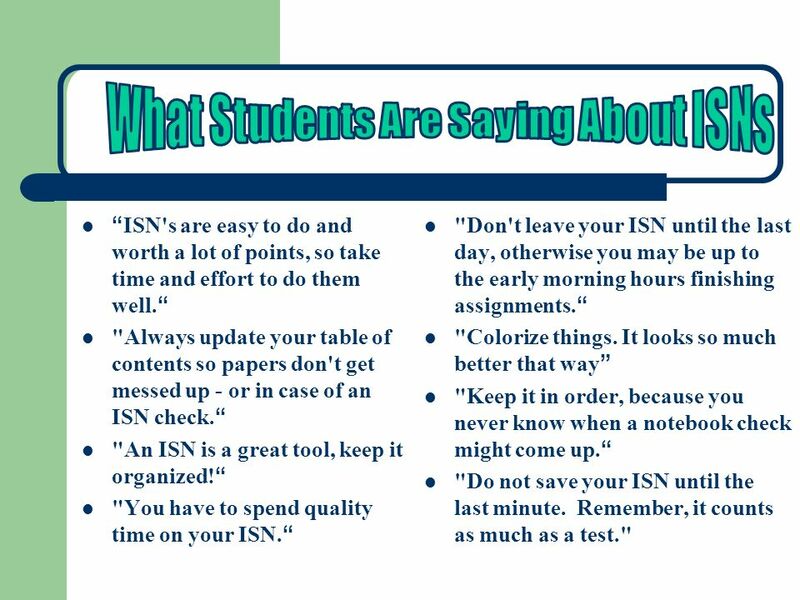 “ISN's are easy to do and worth a lot of points, so take time and effort to do them well.“ "Always update your table of contents so papers don't get messed up - or in case of an ISN check.“ "An ISN is a great tool, keep it organized!“ "You have to spend quality time on your ISN.“ "Don't leave your ISN until the last day, otherwise you may be up to the early morning hours finishing assignments.“ "Colorize things. It looks so much better that way” "Keep it in order, because you never know when a notebook check might come up.“ "Do not save your ISN until the last minute. 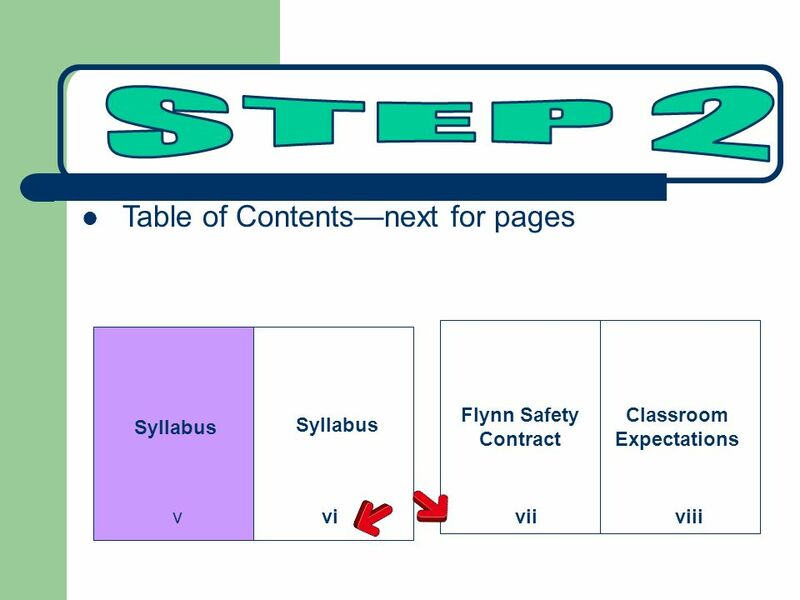 Remember, it counts as much as a test." 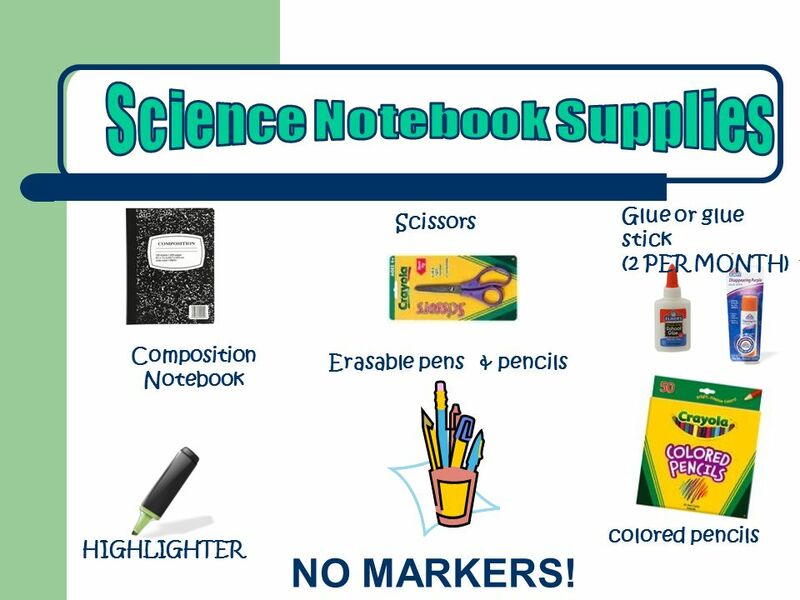 Glue or glue stick (2 PER MONTH) Scissors Composition Notebook Erasable pens & pencils colored pencils HIGHLIGHTER NO MARKERS! 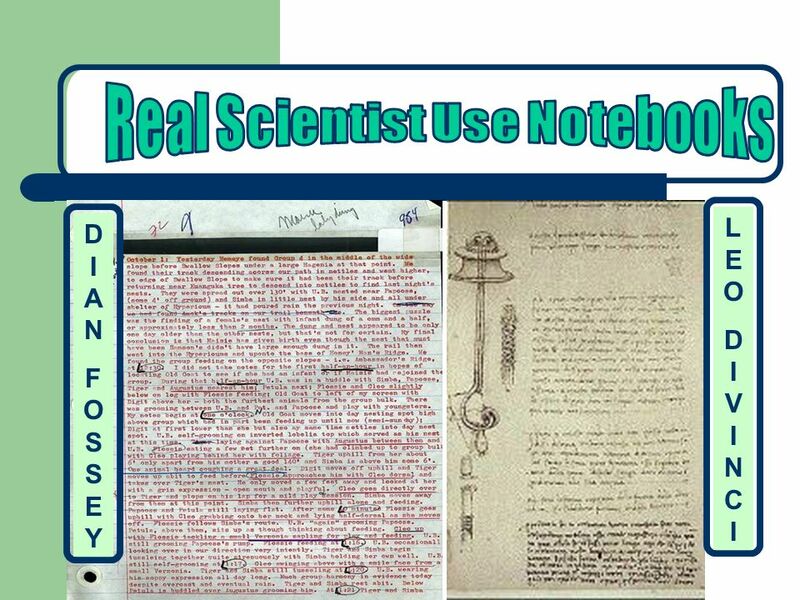 Download ppt "INTERACTIVE SCIENCE NOTEBOOK (ISN)"
“Your Key to Success”. 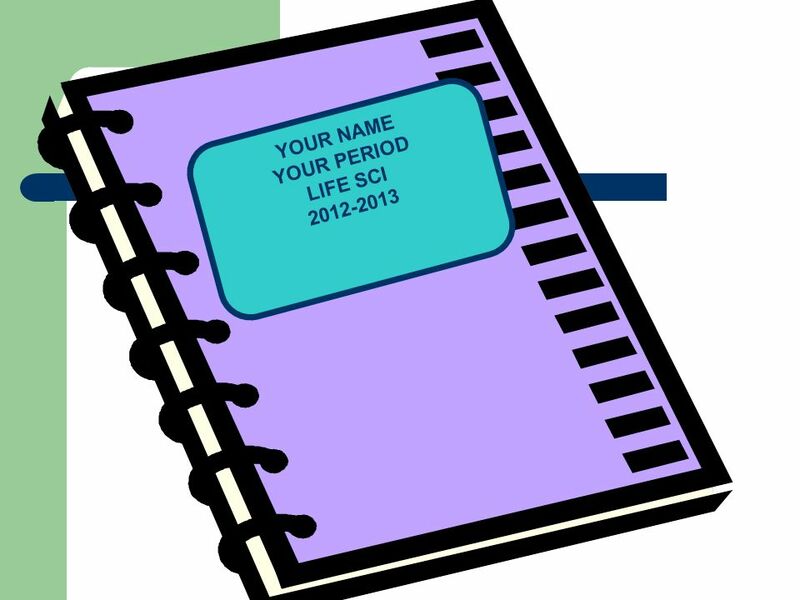 A interactive notebook (INB) your own personalized DIARY of learning about science. 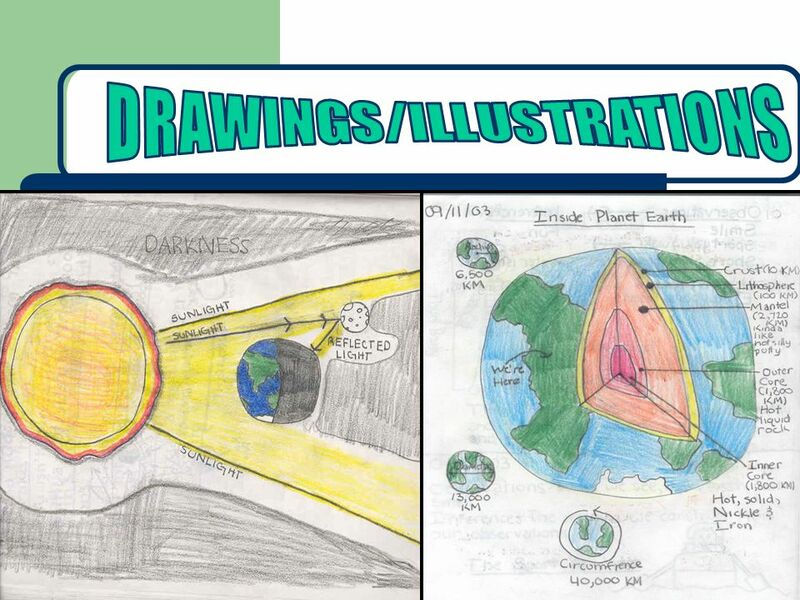 A portfolio of your work in ONE convenient. 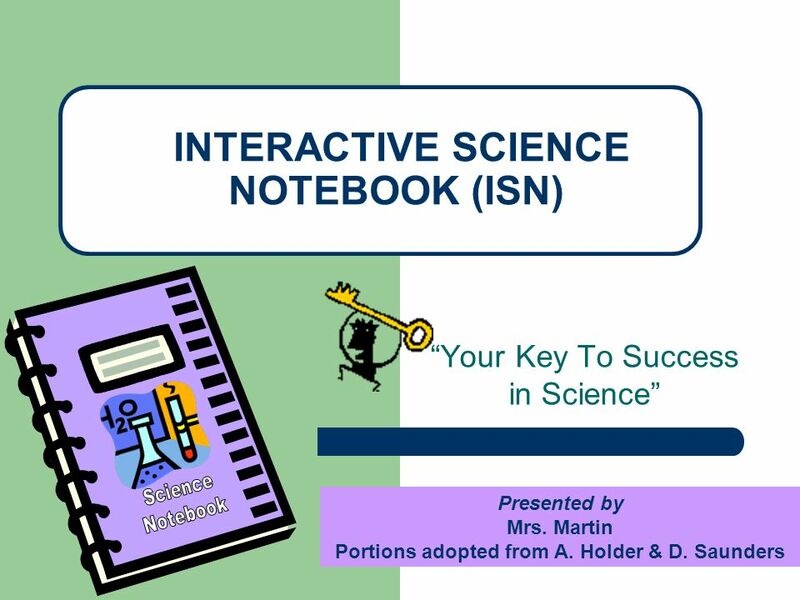 “Your Key To Success in Science” SCIENCE INTERACTIVE NOTEBOOK Presented by Roger Barker Portions adopted from D. Untalan, E. DuBose, A. Holder & D. Saunders. 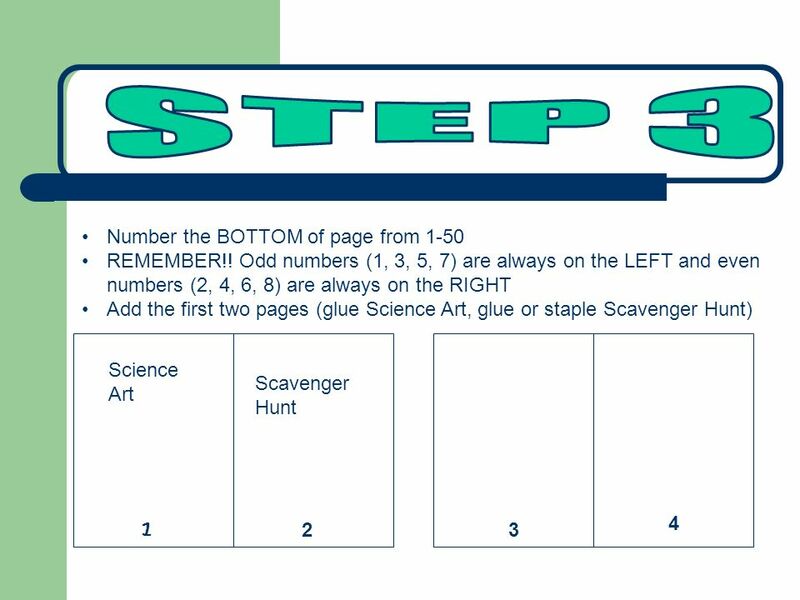 “Student’s Key To Success in Science” INTERACTIVE SCIENCE NOTEBOOK. 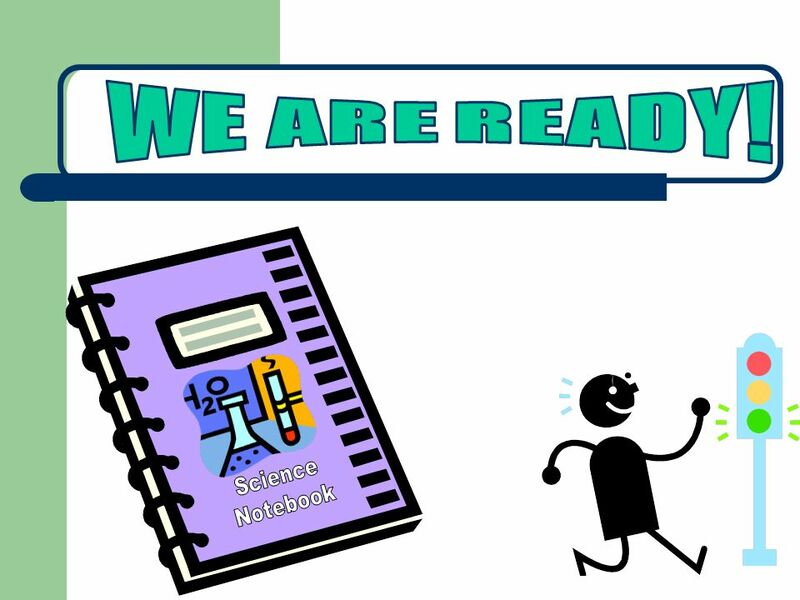 “Your Key To Success in Science” INTERACTIVE SCIENCE NOTEBOOK Presented by Dean Oey. 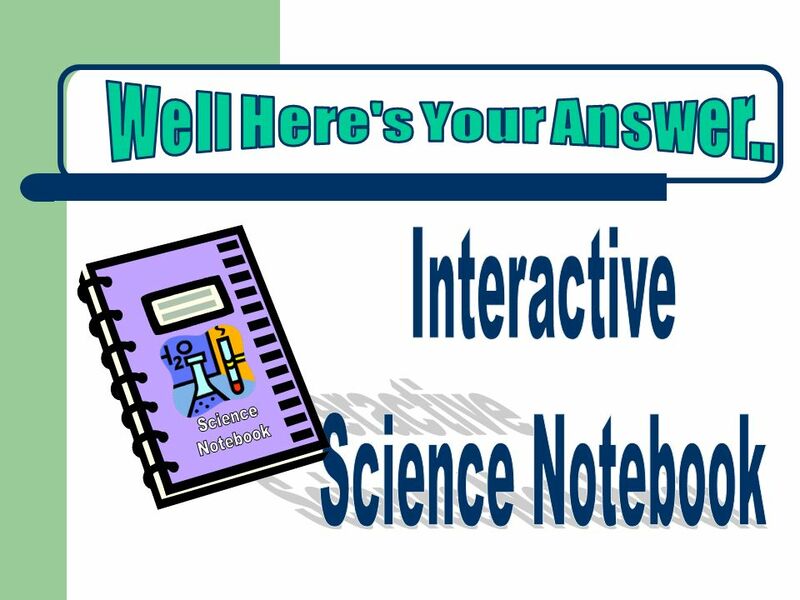 “Your Key To Success in Science” SCIENCE INTERACTIVE NOTEBOOK. 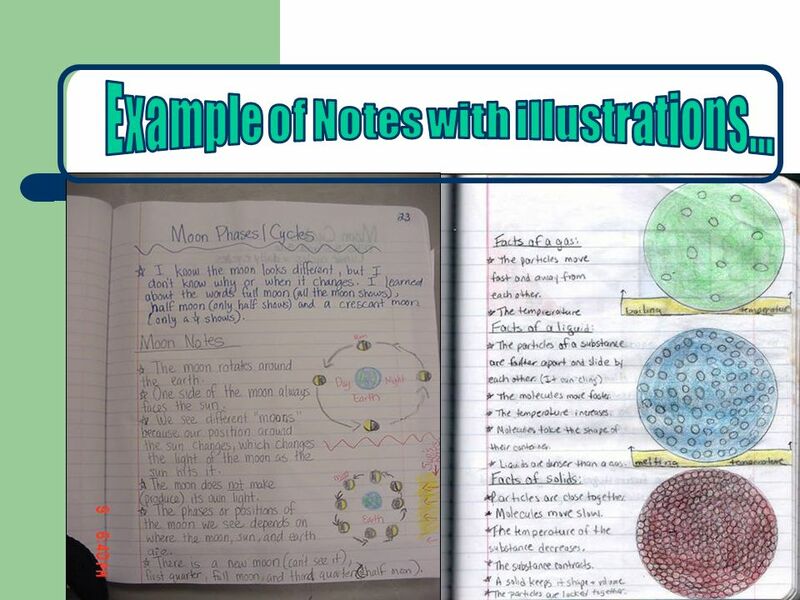 “Your Key To Success in Science” SCIENCE INTERACTIVE NOTEBOOK Presented by Ms. Samita Tahseen Portions adopted from A. Holder & D. Saunders. 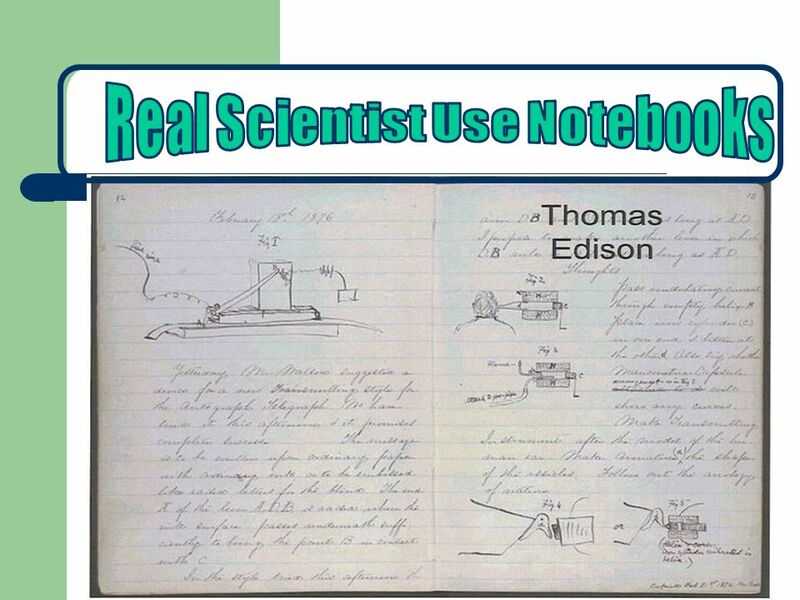 “Your Key To Success in Science” How to use your INTERACTIVE SCIENCE NOTEBOOK. 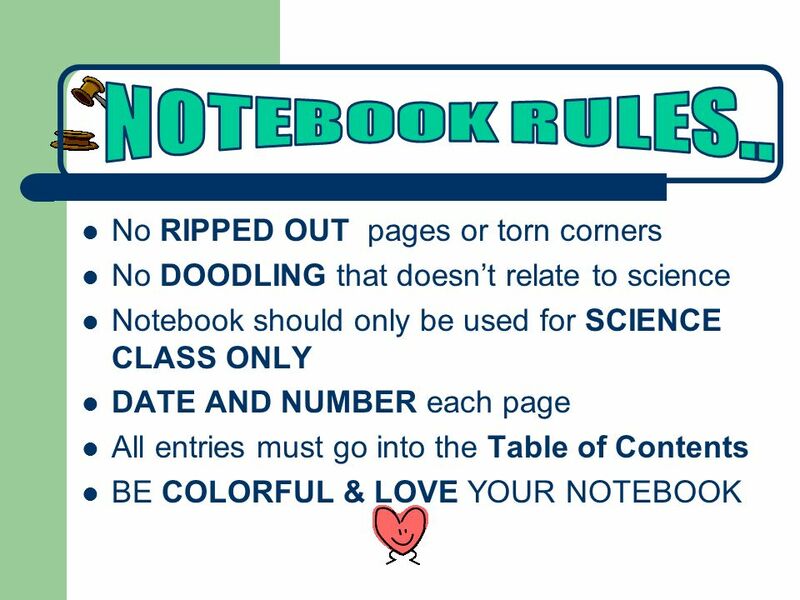  In your NEW Notebook: – Number the first blank page #1, and the back of that page #2. 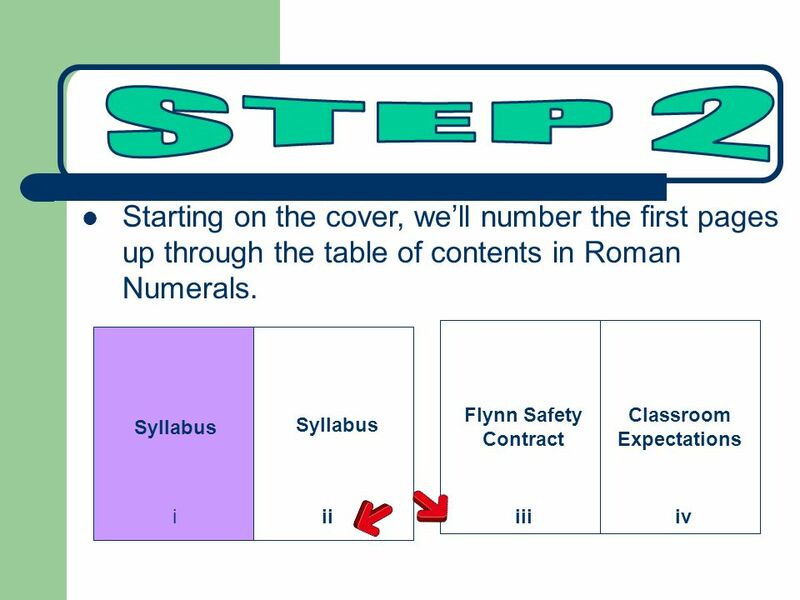 – Continue numbering to at least #20 (We will fill up almost 20. 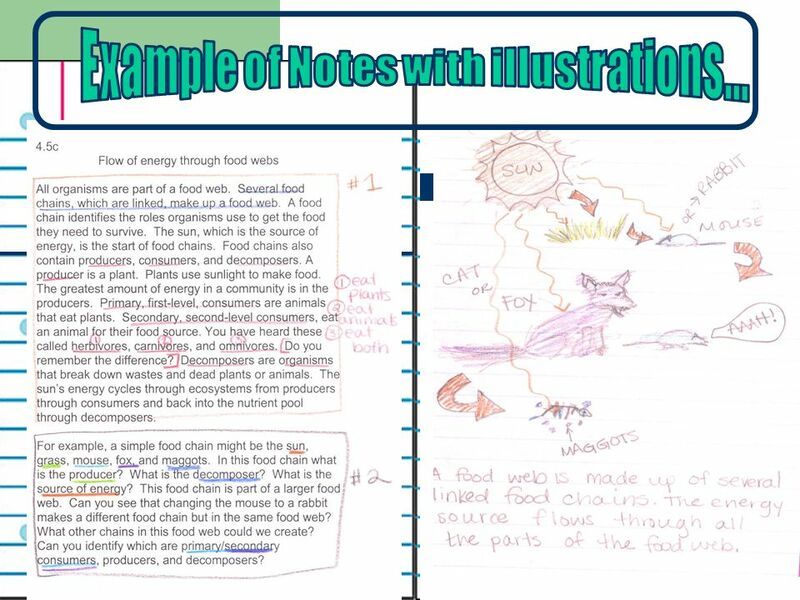 “Your Key To Success in Science” INTERACTIVE SCIENCE NOTEBOOK Presented by Ms. Cloutier-Simons Portions adopted from E. Dubose, A. Holder & D. Saunders. 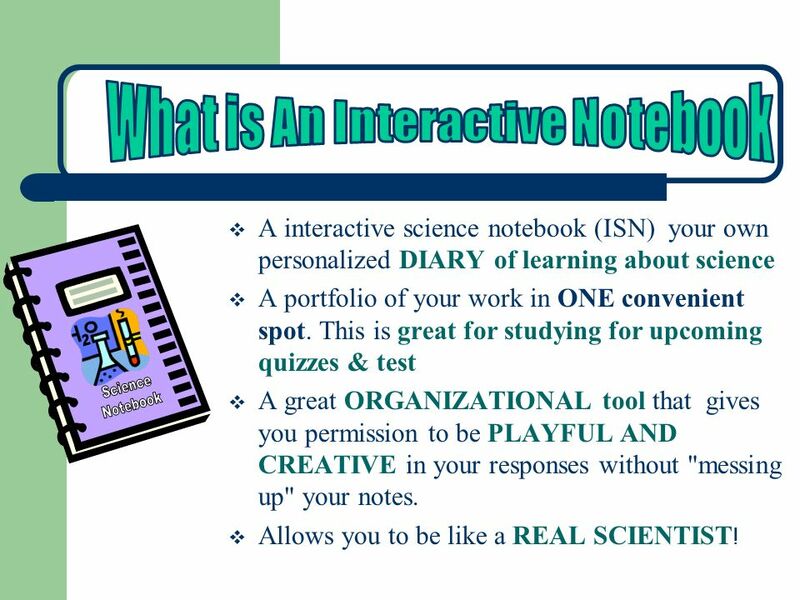  A interactive notebook (INB) your own personalized DIARY of learning about science  A portfolio of your work in ONE convenient spot. This is great. 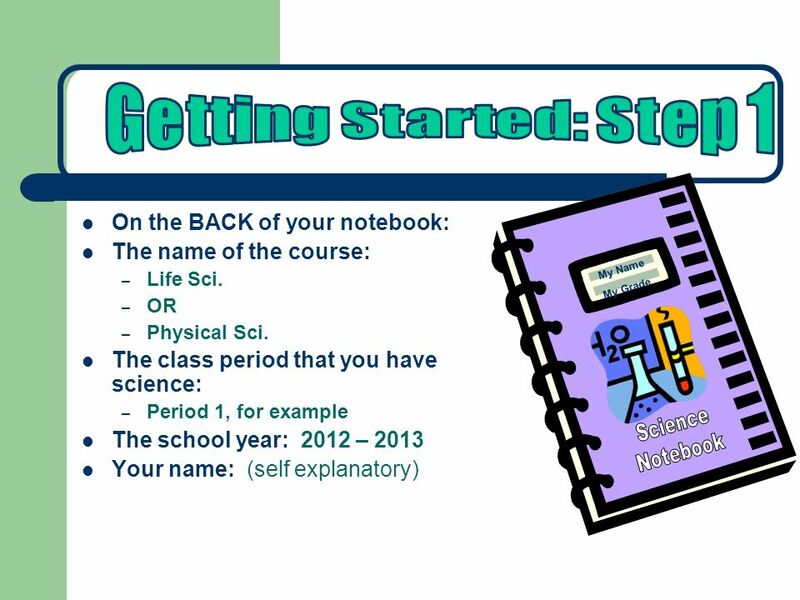 “Your Key To Success in Science” SCIENCE INTERACTIVE NOTEBOOK Presented by Mrs. Engels Portions adopted from A. 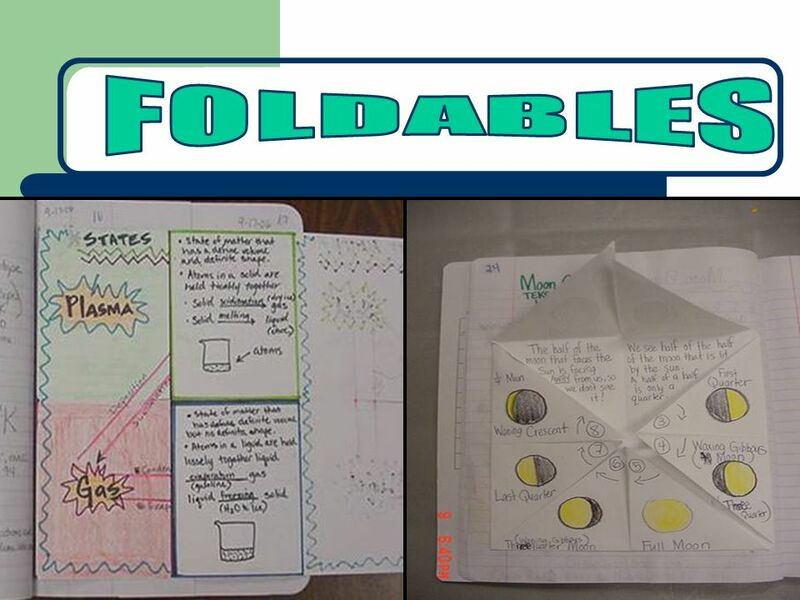 Holder & D. Saunders, Eboni DuBose.